She can't walk freely in a sun-splashed meadow. She can't root about in the dirt, as is customary for her species. She can't socialize with others of her kind, or form family bonds, or raise her young in the manner which nature intended. In fact, she can't even turn around. For breeding sows on modern factory farms, there are only endless months of confinement, trapped inside a narrow device commonly referred to as a gestation crate. Beneath their feet, slatted floors allow their feces and urine to drop down into large pits, where they collect until periodic removal. 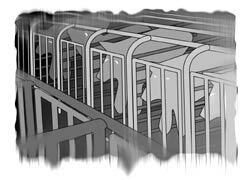 Toxic fumes and bacteria abound in the air, and sunlight does not reach inside the cavernous warehouses that serve as grim prisons for these helpless animals. With no regard for the comfort or natural tendencies of these intelligent, sensitive creatures, factory farmers systematically subject them to deprivation that is almost beyond imagination. Sows are impregnated over and over, and spend much of their lives locked inside gestation crates, which isolate them within the claustrophobic confines of the steel bars surrounding their immobilized bodies. After giving birth, the mother pigs are then transferred to farrowing crates for a brief lactation period, then impregnated once again, and returned to the gestation crate to continue the cycle. When they are eventually worn out, and unable to produce further offspring, they are slaughtered. In most cases the spent bodies of these hapless animals become low-grade pork products, such as pepperoni and sausage. And so, a miserable existence ends in a violent death. Beyond the physical rigors of gestation crates, there is, for these highly social animals, a terrible psychological toll, as well. According to an excerpt from a scientific report compiled by Farm Sanctuary on the welfare of sows in gestation crates, "the lack of environmental stimulation in the stall environment and the sows' inability to perform normal behaviors leads to psychological disorders including chronic stress, depression, frustration, aggression, as well as abnormal and neurotic coping behaviors called stereotypies." In short, the extreme confinement and frustration of life in a gestation crate slowly drives these pigs into deep psychological distress, even psychosis. Chronic, manic behaviors such as bar-biting, 'sham chewing', and aggressiveness are common. It is not difficult to imagine why these behaviors are exhibited; pigs have been shown to share many similarities with humans, both physically and in cognitive terms. When permitted the opportunity, they form close social and familial bonds. They mate and remain together, taking great care in the nurturing of their young. Yet in the life of a pig trapped in factory breeding facilities, all this is taken away. No wonder the prisoners of gestation crates eventually go mad. In the relentless pursuit of greater profits, the animal agribusiness industry has stripped these inquisitive animals of every freedom and instinctive behavior. In order to counteract the illnesses and infections which inevitably result from such intensive confinement in unsanitary conditions, and in an effort to further maximize their investment, factory farmers administer massive non-therapeutic doses of antibiotics to the animals, making them gain weight at a freakish pace. Overuse of antibiotics leads to the emergence of antibiotic-resistant germs. These antibiotics are then passed on to humans when they eat pork products, and the result is the reduced effectiveness of antibiotics administered for the treatment of illness in the human population. In fact, the Centers for Disease Control and Prevention (CDC) recently expressed alarm that antibiotics have become 17% less effective in treating pneumonia germs in recent years. The CDC places the blame squarely upon the animal agribusiness industry, which consumes over 50% of all antibiotics administered in the U.S. today. "The breeding sow should be thought of, and treated as, a valuable piece of machinery whose function is to pump out baby pigs like a sausage machine." "Forget the pig is an animal. Treat him just like a machine in a factory. Schedule treatments like you would lubrication. Breeding season like the first step in an assembly line. And marketing like the delivery of finished goods."-J. Byrnes, "Raising Pigs by the Calendar at Maplewood Farm," from Hog Farm Management Magazine. "Estrus control will open the doors to factory hog production. Control of female cycles is the missing link to the assembly line approach." "Science tells us that she [a sow] doesn't even seem to know that she can't turn...She wants to eat and feel safe, and she can do that very well in individual stalls." Such statements demonstrate the industry's ongoing attempts to justify to an uneasy public the methods currently employed in factory farming operations, including gestation crates. However, there is a rising tide of protest against these methods. In Europe, gestation crates have been outlawed, as a result of public outcry and concerted campaigns by groups and individuals concerned about the obvious welfare and ethical concerns raised by these cruel devices. Here in the United States, as more Americans become aware of the horrors of gestation crates and all that these systems entail, similar efforts to ban the crates are underway. Currently, groups involved in humane farming issues are working to ban gestation crates in the state of Florida. The Animal Rights Foundation of Florida, the Humane Society of the U.S., and Farm Sanctuary are spearheading the effort to place an initiative on the 2002 ballot of that state, which if passed would outlaw gestation crates. These and other concerned parties have organized to form Floridians for Humane Farms, and are now gathering signatures across the state. Email your feedback on this article to editor@impactpress.com.